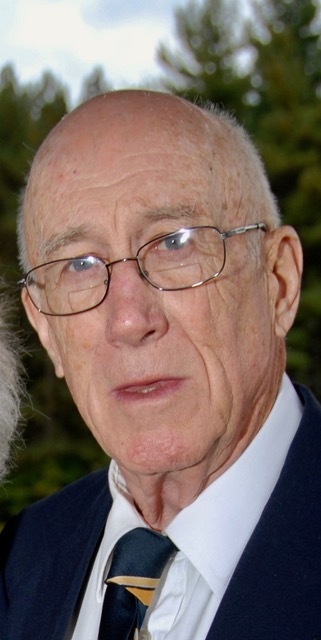 Obituary for Robert (Bob) Stewart Young | Heubner Funeral Home Barry's Bay Ltd.
Robert (Bob) Stewart Young, age 93, died peacefully on January 18, 2019 in Barry's Bay, Ontario. Bob lived a simple yet rich and meaningful life. His engaging personality and keen sense of humor drew people to him. He would say that he had a wonderful life. Bob was born on September 22, 1925 in Buffalo, New York to Ethel Griffiths and Robert Young. He grew up in a loving household with his sisters Alice, Ethy, Loretta and Virginia. On his 18th birthday, Bob joined the Navy. He trained as a signalman and was assigned to guard supply ships in both the Atlantic and Pacific during WWII. This experience would inspire his lifelong interest in travel. After the war he attended Georgetown University's School of Foreign Service where he met Jean Walden. After they graduated, they married in June 1950 at Holy Trinity Church in Washington, D.C. They moved to Alexandria, Virginia where they raised their four children Rob, Terry, Jenny and Polly. It was here that they built lifelong friendships with neighbors while being active in parish life at Blessed Sacrament. During their early years of marriage, Bob and Jean fully embraced the joy and fulfillment of living the Gospel with their lives. They immersed themselves and their family in many social justice activities. He was a founding member of ALIVE, Alexandria's largest non-profit agency providing assistance to people in need. Bob balanced his commitment to nonviolence with his work at the Navy Department by providing draft counseling to young men during the Vietnam War and participating in marches for peace in Washington, D.C.
Bob felt the pull of rural life and in 1982 he and Jean moved to Combermere, Ontario where they had been building friendships through their connection with Madonna House. There he continued to volunteer, driving people to medical appointments, participating in the local cancer support group, and serving on St. Francis Valley Healthcare Foundation committees. Bob and Jean's shared interest in researching their genealogy led to a number of trips overseas to visit ancestral homelands and connect with distant relatives. He generously and lovingly took each of his children and grandchildren to Europe to see their ancestral villages. He made his last trip to Ireland just after turning 90. He delighted in nature where he felt the presence of God when feeding chickadees from his hand, making maple syrup, providing a habitat for monarch butterflies, and tending and preserving the bush for future generations. Bob treasured the simple yet beautiful things in life. He loved gardening, daily walks, ice cream, laughter, puzzles, telling stories, and spending time with his family and friends. He is predeceased by his much loved wife Jean with whom he shared 68 years. He is survived by his son Rob (Jaquie), daughters Terry Jardeleza (Jack), Jenny Traynham (Mac), and Polly Young (Heidi Gemperle), sisters Sr. Virginia and Sr. Loretta Young. 24 nieces and nephews, 11 grandchildren, 7 great-grandchildren and numerous friends, each of whom he cherished. A funeral Mass and celebration of his life will be held on Saturday June 1, 2019 at 11 am at Holy Canadian Martyrs Church in Combermere, Ontario. A luncheon will follow. There's still time to send flowers to the Funeral Mass at the Holy Canadian Martyrs Roman Catholic Church at 11:00 AM on June 1, 2019.